Advanced Tree Service, LLC is a company founded on tradition, dedicated to conservation, and committed to excellence. We take the utmost pride in our work and strive to build a lasting and trustworthy relationship with our customers. We are a licensed and insured company that provides a highly skilled and professional atmosphere. Our top priorities are safety and customer satisfaction, and we excel at both. Not only do we handle shaping, pruning, and hazardous tree removal, but we also have been on many storm cleanups from New York to Colorado. 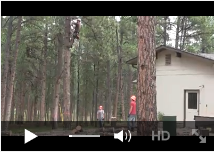 We have also been sub contracted by other local tree services from Colorado Springs to Denver. We are a member of the International Society of Arboriculture and we strive to promote tree health through proven techniques and methods. Our customers are amazed at the changes we make to enhance the beauty of their trees and landscape. And, of course, we offer free estimates, senior citizen and military discounts, and our military discount extends to all combat veterans regardless of the length of service. Why is it important to choose a top -notch tree service? Because it is one the most dangerous professions in the world and accidents are always detrimental to property and those involved. Secondly, improper techniques and untrained workers can cause irreversible affects to your trees.